The No. 1 Ohio State men’s volleyball team remained unbeaten to begin the season, defeating Stanford 3-1 at St. John Arena Friday night. The Buckeyes (2-0) beat the Cardinal (0-4) in the first two sets before losing the third, then overtaking them in a tight fourth set that decided the match. 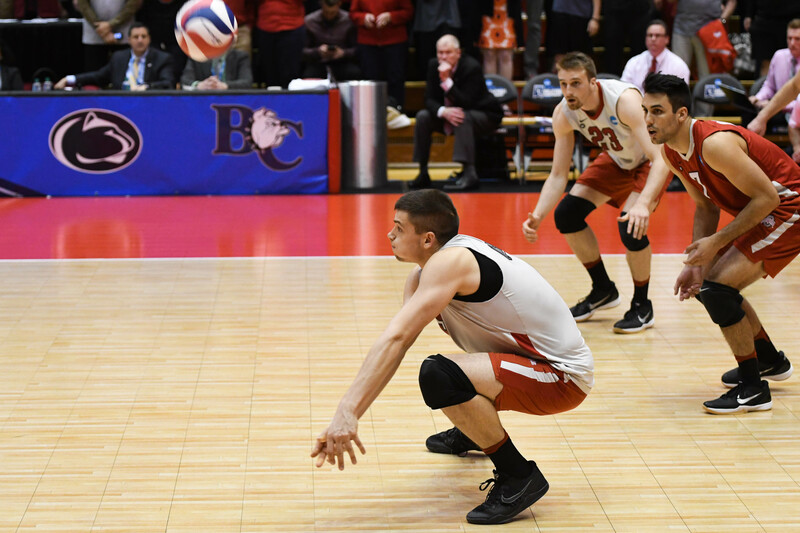 Ohio State senior outside hitter Nicolas Szerszen led both teams in kills, scoring 17 of the his team’s 44 kills. Stanford senior libero Evan Enriques was the match leader with 15 digs and his teammate, redshirt senior middle blocker Kevin Rakestraw, led his team with 12 total kills. Both teams struggled in the opening set with missed serves, but the Buckeyes steadily increased their lead and won the first set 25-18. The seven-point advantage was the largest by either team at the end of a set. In the second set, Ohio State had a team hitting percentage of .526 and 12 kills, the most in any frame. Passes to junior setter Sanil Thomas allowed for varied attacks from the entire court, including powerful back-row attacks from Szerszen and senior outside hitter Maxime Hervoir. The Buckeyes took the set 25-22. The third set proved to be a challenge for Ohio State. Stanford cut down on its service errors and took the lead. High energy on Stanford’s side of the net, along with a strong defense led by Enriques, gave the Cardinal the extra momentum it needed to win the set 25-22. With the game on the line in the fourth set, the Buckeyes and the Cardinal fought point-by-point in the last 10 plays. Each rally was its own battle and Hervoir sealed the deal for the Buckeyes with a kill, winning them the set 25-23 and the match 3-1. For the majority of the match, both teams stuck with their starters. Blough said although a consistent group of Buckeyes played, a few positions are not quite locked in. “I think the coaches do a good job where they try to base it off what happened in practice in the week, so if you perform in practice then I think you’ll get a chance to play on the court,” Blough said. The Buckeyes will play host to No. 6 BYU, a team they beat to win the NCAA championship in each of the past two seasons, at 7 p.m. Saturday at St. John Arena.